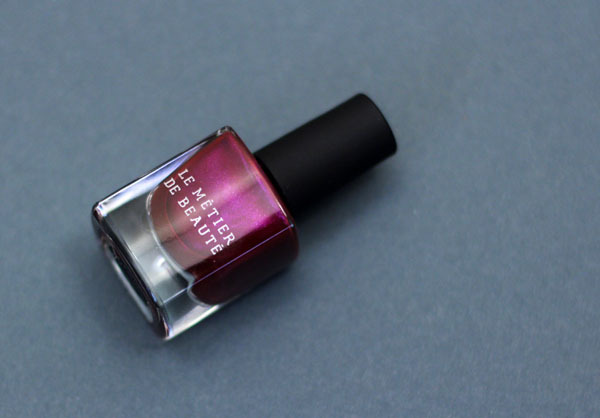 As promised, here's Gypsy Rose Me, the accompanying nail lacquer to Ken, Red My Lips from the Le Metier de Beaute Bordeaux Collection. 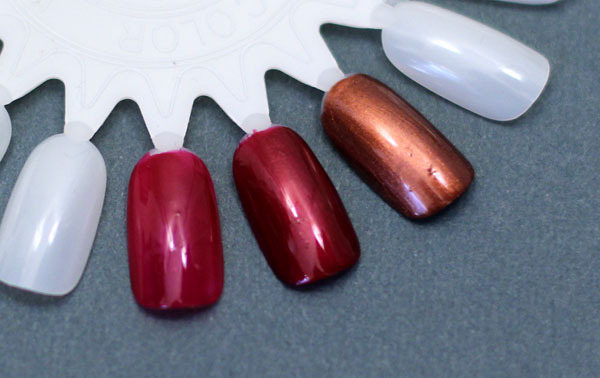 I also thought of including the other two nail lacquers from the Silk Road Collection missing from this post. All summer (since I heard of it, at any rate) I have been waiting for Silk Road to hit the counters, and I'm glad to announce the months of pining paid off. As I thought, it resembles melted copper on fingernails. Just look at that metallic gleam! I placed Gypsy Rose Me and Dynasty side by side so you could compare both of them. Both are berry reds with fuchsia undertones. Gypsy Rose Me is like the lighter hued sibling of Dynasty, where Dynasty boasts more of a sheen and a darker hue compared to Gypsy Rose Me. However, I personally think Gypse Rose Me is more interesting as a color - Dynasty reminds me of one of the many ubiquitous reds we see all year round. Application and formula are of the usual great standard: smooth, easy. Gypsy Rose Me required two coats for opacity. I think I could have gotten away with one for the other two, but I'm a creature of habit, so I applied two coats of polish for all three colors in the above photographs. Both Dynasty and Silk Road retail for $10 and are only available in the smaller bottles. Gypsy Rose Me is housed in a larger-sized one and is available as part of the Bordeaux Collection set, which retails for $49 exclusively at Neiman Marcus stores and neimanmarcus.com. 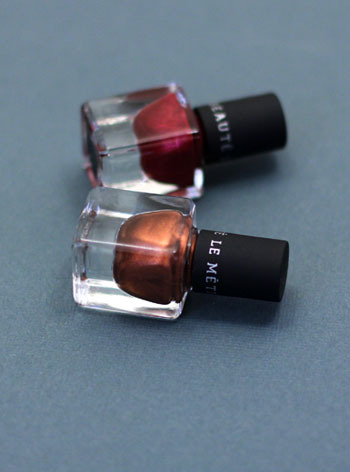 Dynasty and Silk Road were sent to Messy Wands from Le Metier de Beaute for consideration. I was not obliged to post about them, nor do I receive compensation for doing so. Gypsy Rose Me was purchased separately for this review. Silk Road is my favorite! I wish I could buy the Gypsy Rose polish separately since I love that color. 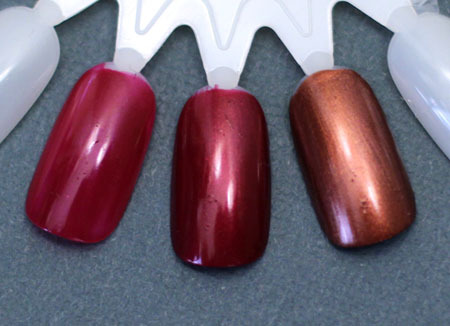 I'm happy with the other fall nail polishes from LMdB though. You look so fabulous in the lipstick that the set is perfect for you.